Focus Your Team for Powerful Productivity -- "Think 20%"
As I’ve traveled across the country through the years, working with leaders in organizations of all shapes and sizes, I’ve recognized what I think is the greatest risk to our organizations. It’s not a lack of strategy, or a lack of passion, or a lack of commitment. The greatest risk to our organizations is…a lack of FOCUS. We lack focus on the most important initiatives and activities that drive our organizations forward to growth and prosperity. I don’t believe the whirlwind ever goes away, but I do believe we can tame it. We can tackle it. We can bring a greater sense of focus to our work for those important Big Rocks that drive growth and innovation. The strategy of “Think 20%” is first a mindset. This is important because our mindsets – how we THINK about our lives and our worlds – drive our behaviors. The idea of 20% shows up frequently in the literature on time management, productivity and execution. It’s based on the idea of the Pareto Principle – more commonly known as the 80/20 Rule. The 80/20 rule indicates that, in all sorts of human endeavors, 80% of our results come from 20% of our inputs. For example, in many countries, 80% of the wealth is held by 20% of the population. At home, 20% of your carpet gets 80% of the wear. In your closet, 20% of your clothes are worn 80% of the time. In business, 20% of our customers generate 80% of our sales, and 20% of our products generate 80% of our profits. While it’s not necessarily always 80/20 – sometimes it’s 90/10, 70/30, 60/40 – you get the idea: A smaller number of inputs yields most of our results. This mindset of “Think 20%,” based on the Pareto Principle of 80/20, can also be turned into a skill set. 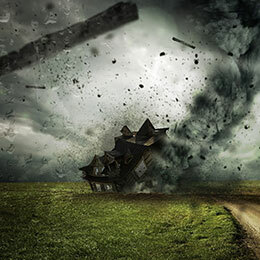 It can be applied in specific ways to help you and your team tame the whirlwind. 1. “Think 20%” to focus your daily ACTIVITIES, the specific actions you and your team take each day. If the top 20% of your activities is yielding 80% of your results, it may be best for you to focus on activities and tasks that offer the big payoff. 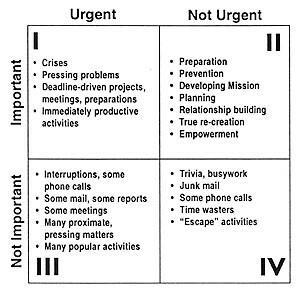 Covey argued that we should strive to live our lives above the center line, doing things in Quadrant I (important and urgent), but also making time for things in Quadrant II that are important but not urgent – what Covey called our Big Rocks – like our project work and contributions to initiatives. Problem is, for many of us, it feels like we spend all our time in Quadrant I – where everything is important and urgent. That’s the whirlwind! If you let the whirlwind consume 100% of your time, it will! The answer? Devote 20% of your time to your Big Rocks, like projects and initiatives – and relegate 80% of your time and energy to the whirlwind. Have your team do the same. If we don’t do this – if we don’t proactively devote time and focus to things that are important and not urgent – those Big Rocks eventually become urgent. And then we’re just trapped in the whirlwind. A lot of us make the mistake of thinking the fundamental building block of managing our time and to-do’s is today. According to many productivity experts, it’s not the day. It’s the WEEK. So, if you want to get a better handle on your whirlwind, start thinking in terms of the week. On Sunday evening or Monday morning, write down everything you want to accomplish that week. It gives you a bird’s-eye view of everything coming your way. It spreads out your to-do list, giving you greater flexibility about what you’ll do – and when. As a result, it gives you a better sense of control over your whirlwind. From there, you can see: What are my Big Rocks this week, my 20%? And then, over the course of the week, you can choose where to devote 20% of your time to those things that are important but not urgent. One last note here. I know that some of you are doing the math. Let me help. In a forty-hour work week, 20% means…8 hours. Yup – 8 hours, spread out over a week, to devote to your Big Rocks, your projects, your initiatives, those important but not urgent things that will drive your team and the business forward. And if 8 hours or 20% of your time each week sounds a little too crazy, or a little too scary, start with 5% or 10% and work your way from there. If you like this idea of “Think 20%,” here are four ways you can integrate it into the work of your team. Talk with your team members individually about “Think 20%” and the Pareto Principle. Share this article. Ask them what they think are the highest priority responsibilities in their work, their “20% items.” Once identified, ask them how they think they can create more focus on those items in their daily work. Brainstorm with your team all the common activities they engage in throughout an average day. Have them rank the activities in importance and isolate the top 20%. Discuss as a team how you all can create more focus and attention on the top 20%. Have daily huddles with the team – a simple five-minute, stand-up meeting first thing in the morning or at the start of your shift. Quickly go around the group and hear everyone’s top one or two items (top 20%) they need to complete that day. Simply having team members speak their 20% activities creates focus and awareness for them, leaving them much more likely to complete those items. Have weekly team meetings with a focus on 20%. Everyone comes prepared with their full to-do list for the week (or the coming week, if you meet, say, on Fridays). On their lists, they identify their top 20% items and report them to the team. Next week at the team meeting, open the meeting by going around and having everyone report on how they did on their items the previous week before reporting out for the new week. There are few better ways to create team accountability and productivity. Please welcome Lemberg Guest Blogger, John Rutkiewicz. John has more than 30 years of experience as a leader and manager in fields ranging from sales and marketing to customer service, financial services and human resources. Since 1993, he has provided facilitation, training, coaching and leadership-development support to hundreds of leaders, from front-line supervisors to C-suite executives. John is a facilitator and certified coach for Living As A Leader in Brookfield, WI. Follow John on LinkedIn. Subscribe to our blog and e-news today.